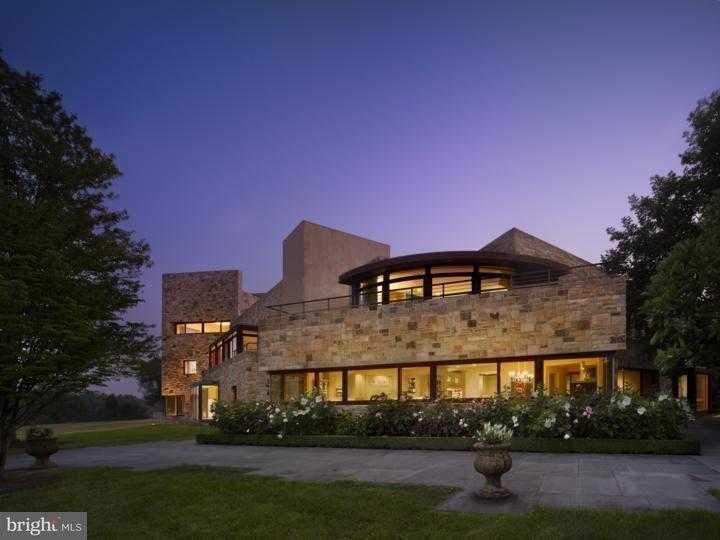 One of the most prominent estates in the Philadelphia area, this modern home of 37,000 sf was conceived by world-renowned architect Rafael Vi~oly, and resides on nearly 29 exquisite acres. Set within an impressive stone courtyard, the main house offers museum-quality galleries and hallways suitable to display vast art collections, yet also perfect for a more casual and intimate lifestyle. Divided into three elegant wings, the interior maximizes views of the courtyard and exquisite grounds via floor-to-ceiling windows in all rooms and interior corridors facing the courtyard. The North Wing is devoted to the family, the East Wing is devoted to two Dining Rooms and the South wing is devoted to a heroic scale Living Room, Grand Foyer and Media room. A tower provides 360 degree views of the entire estate. The verdant grounds also hold a pavilion, as well as a scenic swimming pool complete with a poolhouse. 15′ & 30′ ceiling heights in certain rooms. Taxes reflect entire parcel. This is a partial offering of MLS #6422283. Please, send me more information on this property: MLS# 1000270731 – $10,000,000 – 7111 Sheaff Lane, Fort Washington, PA 19034. I would like to schedule a private showing for this property: MLS# 1000270731 – $10,000,000 – 7111 Sheaff Lane, Fort Washington, PA 19034.